Hey folks....lots to report with Labor Day weekend in this review. August 29-30. Only one race to report here (following Timberman). But it was a big one....The Cranberry County Triathlon. This olympic distance race is always heavily attended by BTT and this year was no different. We had at least 6 BTTers race (at least those who registered results! ), with long time member Scott Stavely placing 2nd in the male 40-44 AG, and Brett Johnston's relay team finishing 3 relay team overall and 2nd in its division. Nice job everyone! September 5-7 (Labor Day Weekend). There was lots of racing going on over this extended weekend. The big race(s) of the weekend was the Plymouth Rock Triathlon Festival, which included the Mayflower International Distance on Saturday, and the Plymouth Ironman Distance and Iron Aquabike on Sunday. On Saturday, as par for the course, Rachel Saks dominated her AG and finished 41st overall. On Sunday, Krista Schepanovsky tackled the full iron distance race...trying to exorcise some demons from the previous year. Also, Elaine Metcalf, Nicole Kimborowicz and Pat Dwyer (me) competed in the iron Aquabike. Kudos to all those that raced the iron or aquabike. As a veteran ironman racer, I will say that Plymouth was definitely one of (if not the most) difficult iron bike I've ever done. The wind was blowing at a sustained 20mph....and it wasn't a warm wind. And, the roads were terrible...with bumps and ice heaves everywhere. 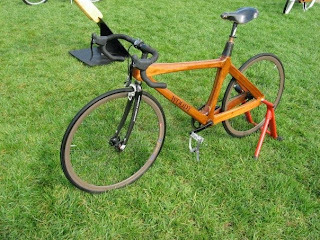 In fact, I broke my aero arm rest 60 miles into it. That being said, it's a nice race...they do a good job. At the end of the day, Krista did exorcise her demons and podiumed with a 3rd place AG finish and a time of 13:47. I came out of post-IMLP semi-retirement to mix it up in my new town of Austin! After six weeks of unpacking boxes, building baby furniture, and starting a new job, I dusted off the BTT kit for my first Sprint(!) distance race in over two years. Long story short, I was finally able to put the BTT "podium" shirt to good use. I placed third in my age group! Yes, Austin, that's how we roll in beantown. Here's my summary: Austin, as you can imagine, is a great town for triathlon. Good people, lots of positive energy, year-round training. What I missed, however, was the cheering section that I've become spoiled with in New England. I didn't hear a single "go BTT." So... the upside of being a little lonely out there was the absence of any distractions... and I found a fast (enough) gear to make the blue and green noticed. Ok, small secret... there was also an Olympic distance option so I have to believe that's where the real players were racing. Richie Cunningham ran away with the men's and Desiree Ficker came from behind on the run to win. I miss all of you and hope you're having a great New England fall. Please look me up if you come through Austin. I'm thinking BTT "WINTER" Training Weekend! 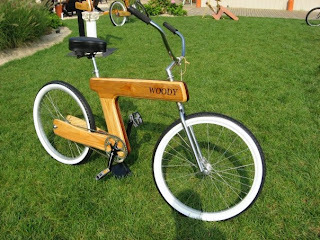 Lastly, I'll leave you guys with a couple of pictures of some pretty cool bikes....Woody Bikes. 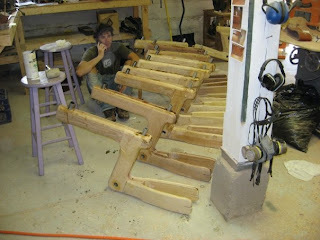 A buddy of mine from Cape May, NJ makes these. I saw them up close in August and they're very cool. However, I don't think you'll see them at any triathlons any time soon!